ProForm ENDURANCE 520 E Elliptical Review by Industry Experts! The ProForm ENDURANCE 520 E Elliptical is On Sale! The ProForm Endurance 520 Elliptical trainer fits in the budget category. We realize the price is very attractive for budget minded individuals, but realize the low price results in some design and engineering compromises. However, if your budget is limited and you are not sure your crosstrainer won’t end up as a clothes hanger, then the Endurance 520E is definitely worth considering. ProForm is part of Icon Fitness, which is the largest manufacturer of fitness equipment in the world. They also make the popular NordicTrack brand. Because of economy of scale they generally offer more for less. Check out a comparison chart of all ProForm ellipticals here. MID-WEEK SALE ENDS THURSDAY: The ProForm Endurance 520E is priced at $599. Financing is available with Free Shipping. Digital Quick Incline – You can adjust the incline from 0-20 degrees with digital quick incline adjustment. 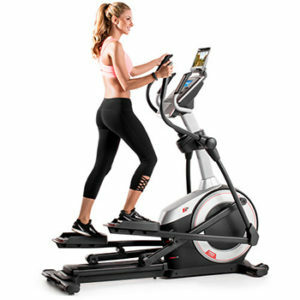 19″ Stride Length – Most will find a 20″ stride to be comfortable, and in fact, many ellipticals in this price range have a more restricting 18″ stride length. 15 lb. Flywheel – The weight of flywheel contributes to a smooth and natural elliptical motion. At 15 lbs. you will notice that the motion is not close to the quality you would get on commercial machines found in fitness clubs. However, this is still an excellent flywheel weight for this price point! Warranty – Consists of 1 year parts and labor, which is what you would expect at this price range. The good news is that elliptical trainers tend to have fewer service issues than a treadmill. Adjustable Foot Pedals – By adjusting the foot pedals, you can reduce foot lift and the numbness that comes with it. 175 lb. 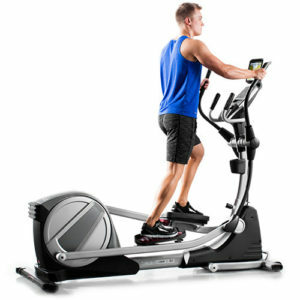 Unit Weight – If you are into intense workouts the ProForm ENDURANCE 520 E Elliptical Trainer may not be a wise choice. You may find some swaying and instability. Also the 300 lb. weight capacity is very excessive. Think about it, how stable is a 175 lb. machine going to be with a 300 lb. user? Create custom workouts designed to target fitness goals. Track your stats and your progress online. Simulate running outdoors with Google Maps. There is an additional cost for iFit Live, but it is very popular with users. 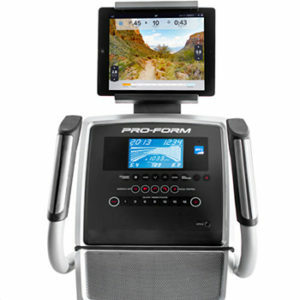 ProForm Smart Strider 695 – Spend $200 more for this machine for better quality. – Read our full review here. The ProForm Endurance 520 E Elliptical Trainer has its limitations and is best suited for moderate users and individuals of moderate weight. As mentioned the 300 lb. user weight limit is rather excessive. However, it is probably the best value for a $599 elliptical trainer. If you can afford $200 more, take a look at the ProForm SmartStrider 695. It is more stable, better built, has a longer warranty and a power incline. Or, you may want to check out the ProForm Endurance 720E or the ProForm SMART Endurance 920E models. These are big brothers to the 520E.